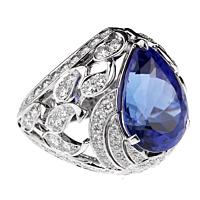 Les Jardins tanzanite & diamond suite is a spectacular one-of-a-kind duo by Van Cleef & Arpels. With the Les Jardins collection, Van Cleef & Arpels draws on the art of ornamental gardening for inspiration with so many of its creations. The jewels are idealized representations of nature constructed by the hand of man. 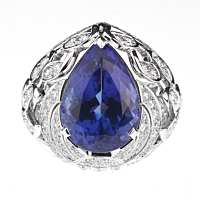 The tanzanite and diamond suite dazzling ring features a vibrant colored, faceted, teardrop shaped tanzanite stone surrounded by 18kt white gold delicate designs, all adorned with the finest round brilliant cut diamonds. To complete the ensemble are a pair of tanzanite stud earrings, also with faceted tear drop center gems and surrounded by the same unique design. This is a rare and special set - only one was made.